The Wiki application provides the content productivity to portal users as a tool to forge the unstructured knowledge. With Wiki, you can create and edit pages by using a simplified markup language or a WYSIWYG editor. Also, your company can use Wiki as an internal reference, such as work policy or a public wiki for comprehensive product information. Wiki along with Forums will complete the ideal combination that helps users enhance their experiences on collaboration activities and build valuable knowledge center for clients. When accessing wiki application, a welcome page is displayed indicating in which wiki you are in. will display the message Welcome to $FirstName $LastName Wiki, where FirstName and LastName are the first and the last name of the user. page will display the message Welcome to Space $SpaceName Wiki, where SpaceName is the space name. The message of the welcome page in Wiki application, either for users profiles or spaces is a static message. It tooks the first set parameters i.e. the first $FirstName and $LastName set by the user and the first $SpaceName set by the space’s creator. For example, in the case below, the first space name chosen by its creator was “PM Team” then changed to “Product Management Team” but the wiki welcome page contains always Welcome to Space PM Team Wiki. Steps to perform common actions on a Wiki page (for example, creating, editing, using the editor, managing drafts, adding a related page, and attaching files); information about spreading your content; how to manage page changes (by comparing between 2 versions or by watching); and ways to organize your content. Steps specified for administrators to change space settings, manage permissions and author content via WebDAV. : The Breadcrumb which shows the page hierarchy. : The Wiki administration area which allows administrators only to configure the Wiki settings. : The pages tree view. : The Page Control area which helps users take actions with the current page. : The page information. Click number of attachment(s) to open the Attachments details panel at the bottom of the page. Click Public or Restricted to update the permissions of the page. Type your desired space name in the search box to filter the space and click your space name from the search results. Then you will be redirected to the Wiki home of the selected space. 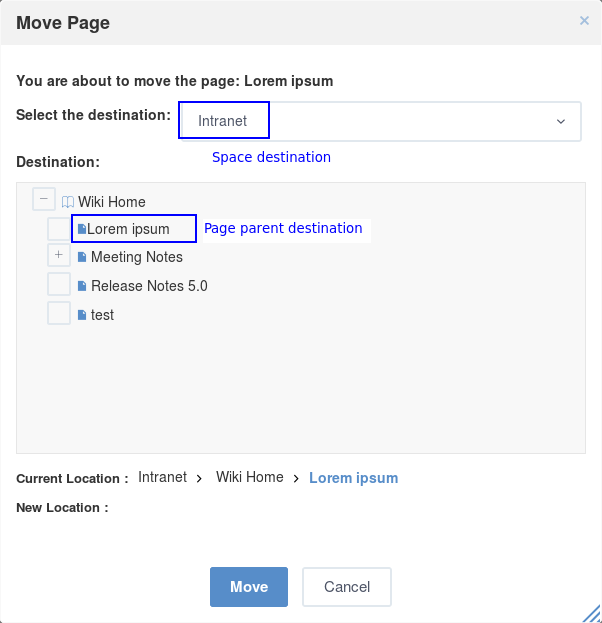 The “My Wiki” and “Intranet” are displayed by default, which will direct you to the homepage of your personal Wiki and Intranet Wiki accordingly. The Wiki content is organized as a page tree in which each page may contain many sub-pages. 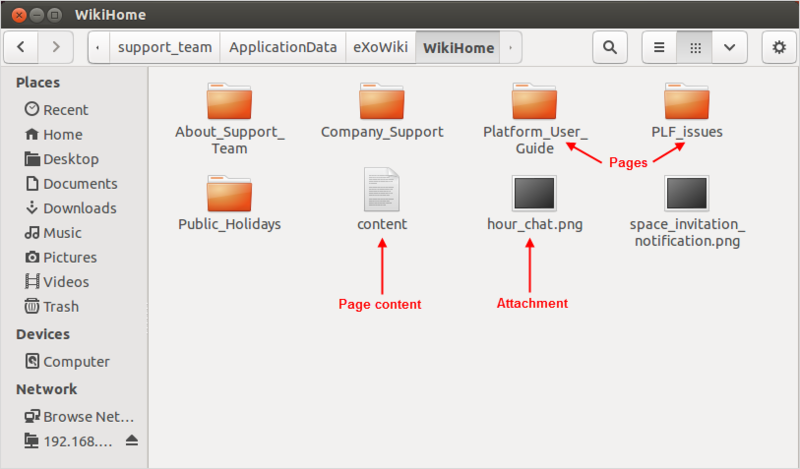 The hierarchy is reflected on UI by the Breadcrumb and the page tree in the left pane. When a page is added, it is always defined as a sub-page to the current one. You can have wikis for portals, wikis for groups or users. Space is a set of pages, so the spaces partitioning means that spaces are independent trees. This separation enables Wiki to provide knowledge spaces for different groups. Intranet wiki: The global wiki of the Social Intranet. 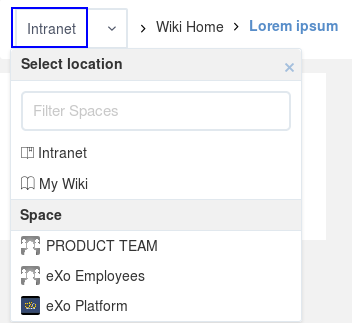 An Intranet wiki is published for every user who can access that portal. Group wiki: The wiki of a space. A group wiki can be understood as a space wiki. The wiki application of a space works as a group wiki for that space. The group wiki can be accessed by members of that group. User wiki: The wiki of an individual user. Every user has his own Wiki. You can switch to My Wiki from the Select Location drop-down menu or from the drop-down menu of the display name. See Working with your wiki for more details. In this document, Spaces are referred as wikis, particularly portal wikis, group wikis and user wikis. Any space which has an implicit root page is named Wiki Home. Instructions on how to add and edit a Wiki page. Instructions on how to share your content with others by publishing your content on the Activity Stream, sharing a link or exporting a page as PDF. Instructions on how to manage versions of a Wiki page and watch a Wiki page. Instructions on how to move/delete a Wiki page. Go to a Wiki space in which you want to create a page. Click Add Page, then select Blank Page. Enter the title for your page. The page title must be unique. Enter the content of your page by using Wiki Markup or the WYSIWYG editor. Click Preview if you want to see how your page looks like. 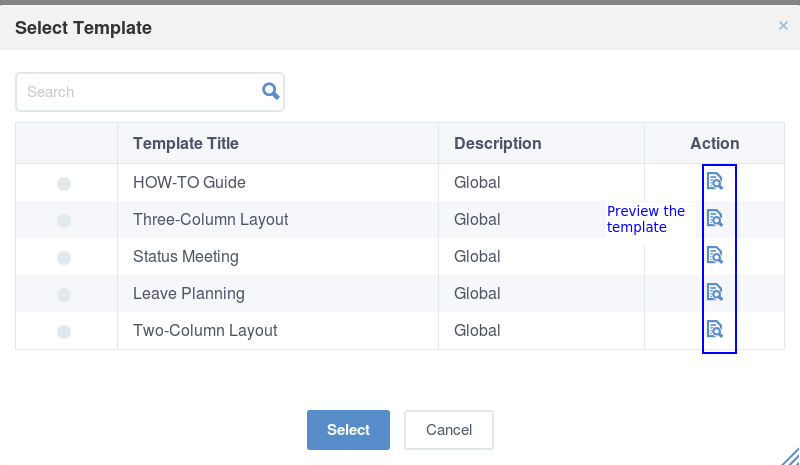 Click Add Page, then select From Template…. A list of available templates will appear. i. Click corresponding to the template you want to see. The template preview appears. ii. Tick the checkbox corresponding to the template you want to select for your new page and click Select. The selected template appears. 4. Enter the content of your page by using Wiki Markup or the WYSIWYG editor. These templates can be created, edited and deleted by administrator. 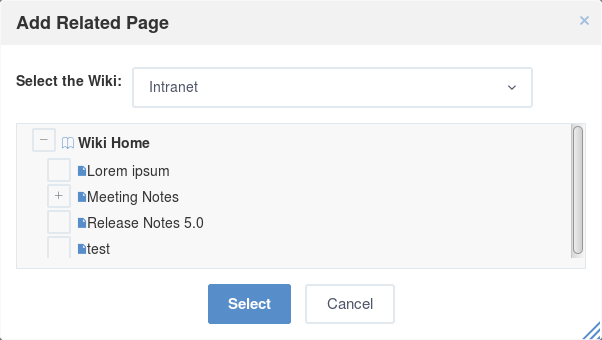 See the Managing a page template section for more details. 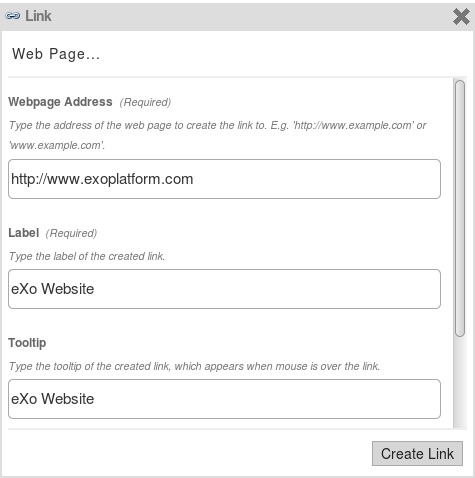 In the Wiki application of eXo Platform, you can add a link pointing to a page which you are going to create later. Such links are called undefined links which are often used to remind other Wiki users to create the page. You must use the Source editor to create the undefined links. 1. Add a link by typing the page title between square brackets ‘[[…]]’ into your page body. 2. Click Save to save the page containing the link. The undefined link is underlined. Click this link to open the Add Page form. 4. Follow the steps stated above to enter the page title, content and save the page. You can edit a page at any time if you have the Edit permission on that page. To edit the whole page content, click Edit in the Page Control area. Your page will be switched to the Edit mode which allows you to rename the page and edit the page content. The toolbar in the Edit mode will be changed to activate the following actions. Switches to the Rich Text (WYSIWYG) editor. Displays the preview mode of the currently edited content. Previewing a page helps you verify the result of rendering the markup you just entered without saving. Opens the Wiki syntax help panel. Inputs the edit reason if necessary. Saves the current page and go back to the view mode. 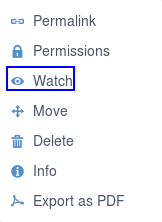 Changes will be sent to watchers via mail notification. Discards the current changes and go back to the View mode. When you input the Version Note field i.e. 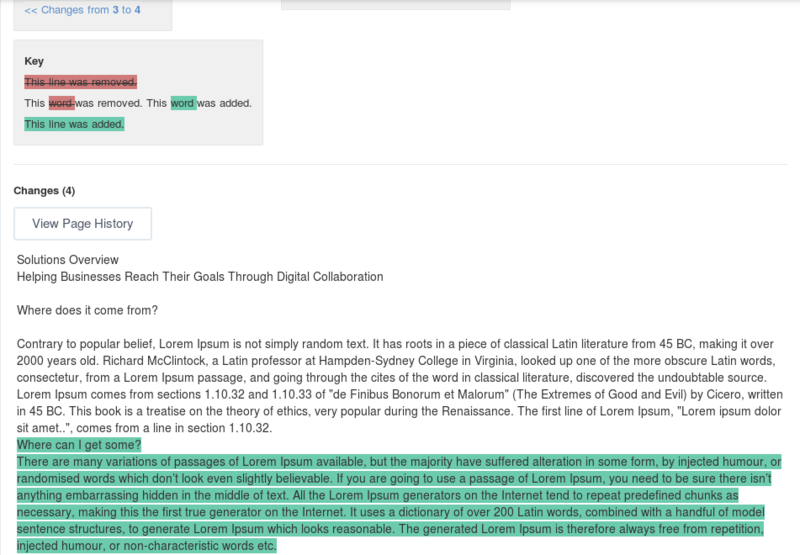 the field , and you check the option Publish on the Activity Stream, the text appears as a comment to the activity generated following to the wiki page creation. You can input the field ``Version Note``even if you did not any change on the wiki page content. To edit only a section in the whole page content, hover your cursor over the title of the section you want to edit, then click . The selected section will be switched to the Edit mode. In the View mode, you can quickly edit the page title by double-clicking it, then press Enter when finishing. WYSIWYG stands for What You See Is What You Get. The WYSIWYG editor allows you to edit an wiki page directly in the wiki markup language. This has the advantage of being faster than the Source Editor for content formatting tasks. You can switch between the Source and WYSIWYG editors at any time by clicking or . In the Source editor, which is selected by default when you edit a page, you have to use the wiki markup language for text formatting, while the WYSIWYG editor enables the content to be appeared during editing that is very similar to the published result. Thanks to available tools on this editor, you can format your content visually without using wiki markups. To learn more about the WYSIWYG editor, you can refer to the WYSIWYG editor user guide. 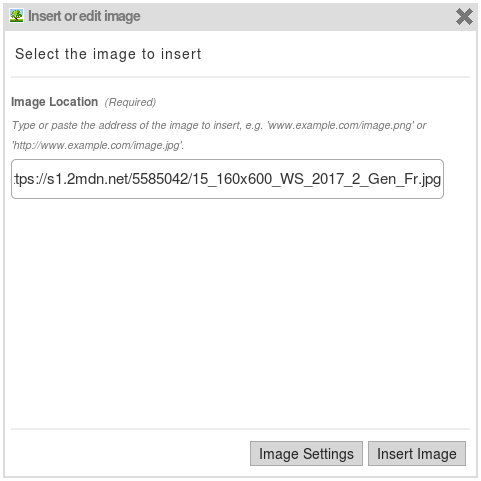 You can insert an attached image or an external image by clicking on the text editor. Select Attached Image… from the drop-down menu. 2. Follow the steps in the Adding an attachment to a page section. Select External Image… from the drop-down menu. Insert the image URL into the input-text box. 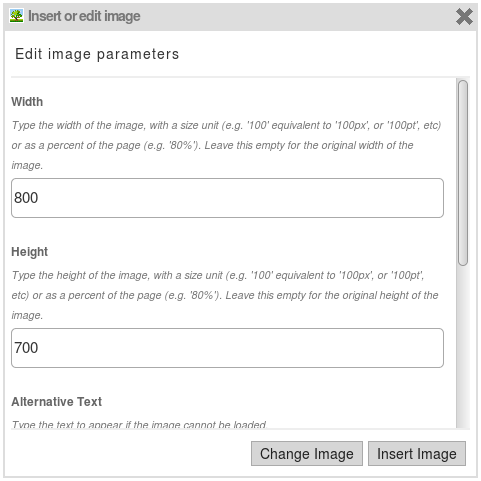 Optionally, edit the image parameters by clicking Image Settings. 4. Click Insert Image button to accept inserting the external image into your Wiki page or click Change Image to select another image. To attach files to a page, follow the steps in the Adding an attachment to a page section. By using macros, you can apply extra formatting, functionality and customization to your content. You can easily add macro tags by using the Rich Text editor. Switch to Rich Text editor. Click Macro, then select Insert Macro… from the drop-down menu. The Insert Macro form appears. The macro is classified into different categories: Content, Development, Formatting and Navigation and Other. 4. Select your desired macro from the selected categories list, then click the Select button, or simply double-click it. For example, if you select the Box macro, you will go to the macro parameters form. 5. Enter parameters into the corresponding fields for your selected macro. Click Insert Macro to perform your macro insertion, or click Previous to return to the initial Insert Macro form. If you do not know how to use a syntax, you can use the Syntax Help function. The Syntax Help is displayed by clicking from the page toolbar. When being clicked, a lateral pane beside the editing area will show all the Confluence syntax information. The lateral pane can be hidden by clicking in the upper right corner or by clicking again. You can click at the bottom of the short Help Tips form to open the Full Syntax Notation page. You can insert icons, emoticons to emphasize the content. The usage is described in the Full Syntax Notation | Icon/Emoticon Support page with examples so you can easily remember and use them. While you are creating or editing a wiki page, your modification will be auto-saved as draft in the My drafts page, and a notification message will be shown near the page title. The draft of this page will be deleted after the page has been saved successfully. Click Yes to accept saving the page as draft to My drafts. Click No to cancel keeping the draft of the page. draft, a warning will be shown that you can view, resume or delete the draft. You can easily manage your drafts in the My Drafts page by clicking BrowseMy drafts. Click corresponding to the draft you want to view. The blue words/lines are newly added. The strike-through pink words/lines are removed. Click your desired page title to continue editing/creating the page with the previously saved modifications. 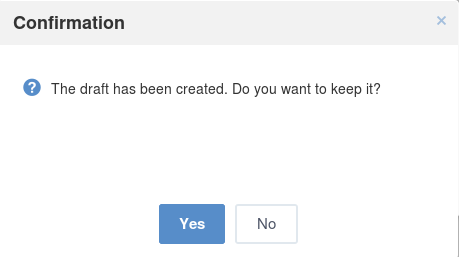 Click corresponding to the draft you want to delete, then click OK in the confirmation message to accept your deletion. Viewing page information is accessible to users who have the View permission on that page. 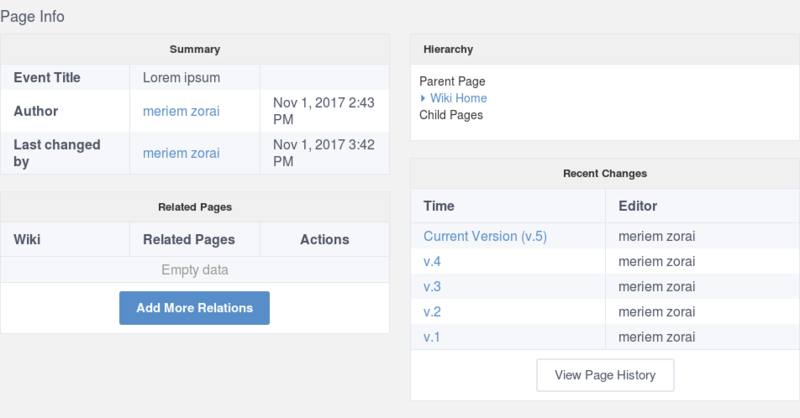 The page information provides all the details about the related pages of the current page, the hierarchy structure of the current page, the page history, and more. Select the page you want to view the information. 2. Click More from the page toolbar, then select Page Info from the drop-down menu. All information of the opening page, including page summary, related pages, page hierarchy, recent changes will be displayed. This feature allows you to add pages related to your page. This function can be done in the Page Info view and is activated to users with the Edit permission. 1. Click Add More Relations in the Page Info view, then select the related pages in the Add Related Page window. Click Select to add the selected page to the list of the Related Pages. Attachments are any files enclosed with your pages. They may be images, documents, presentation or multimedia files. The attachments are displayed at the bottom of a wiki page. View or download an attachment by simply clicking the attachment name. Delete an attachment by simply clicking . In this way, you need to scroll down the page to find the Attachment panel at the bottom. In case you do not see the Attachment panel, click at the page header first. Click Upload New File button to open the upload window. 2. Select a file from your local device, then click Open. The file will then be auto-uploaded. You can use this method when editing the page content with WYSIWYG editor (Rich Text editor). This way will create a link for the uploaded file. Select a page to which you want to add an attachment. Select Edit at the Page Control area. For more details, see the Editing a page section. Select the Rich Text editor on the page toolbar. 4. Click on the toolbar of the Rich Text editor, then select Attached File… from the drop-down menu. The Link form is displayed as below. 5. Select a file to upload. Now you can upload a new file or select one file from existing files. i. Double-click Upload new file/Upload file…, or click Upload new file/Upload file… Select in the Current page or All pages tab respectively. ii. Browse a file from your local device to upload, then select Create Link. Selecting from existing files: Double-click your desired file, or click the file and select Select. The form to edit the link parameters appears. Click Create Link to update the link. 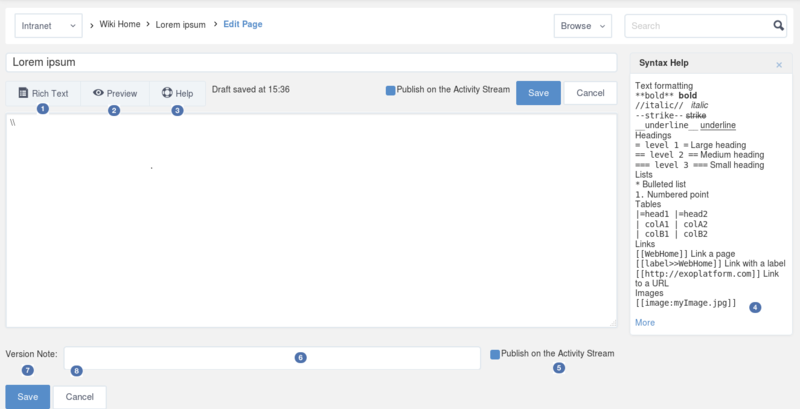 Once you have created a Wiki page, your activity will be automatically published in the Activity Stream with the content abstract. However, if you edit a Wiki page, you can choose to share that activity on the Activity Stream so that people can notice your changes. To share your activity, the page you are working on must be public. To do this, simply check Publish Activity and press Save to save changes and publish the activity. You can also enter your comment in the Comment field to display your comment with the activity. People can view the changes you made by clicking and they will be directed to the Compare Revisions page. Go to a Wiki page where you want to get its permanent link. Or, click the Public/Restricted status indicated at the page header. The Permalink form will display. This form shows the public/restricted status of the Wiki page and the link to share. If the page is public, click Restrict to restrict the access. The form will show that the page is changed into the restricted status and just the authorized users can view and edit it. If the page is restricted, click Make Public to make it public. The form will show that the page is changed into the public status, and anyone can view and edit it. 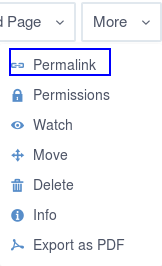 You can set the View and Edit permission to given users by clicking Manage Permissions in the Permalink form. See the Page Permissions section for more details. Go to the Wiki page that you want to export as PDF. Click More in the Page Control area, then select Export as PDF. 3. Select where to save the PDF file, then click Save/OK to start downloading the PDF file. 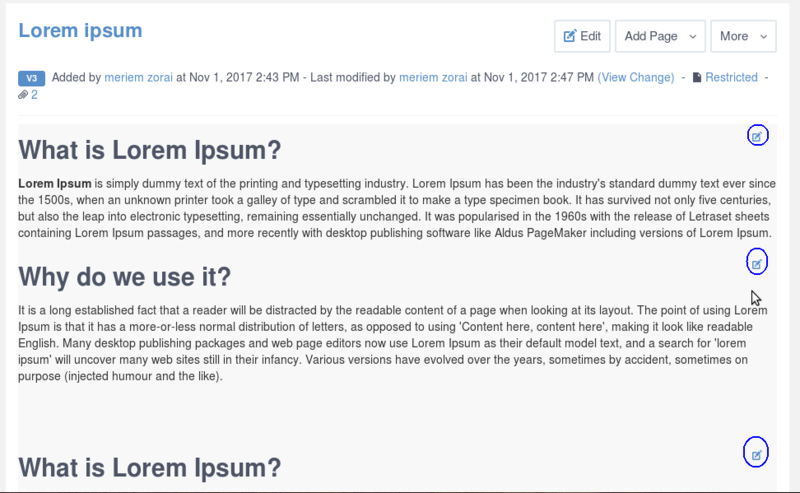 When editing the content of a page, Wiki will automatically create a version of that page after it is saved. Thanks to the page versions, you can make changes on the page safely and roll back to an earlier version without worrying about messing things up. In the Page history view, you can see all versions of a page. Date and time when changes are made. To access the page history, just click View Page History in the Page Info <Adding-Related-Page> view. : Compares selected page versions. : Selects two versions that you want to compare. : Specifies the version labels of the page and link to view a specific version. : The date and time when the page is changed. : The authors who make changes of the page. : The reasons why the changes are made (optional). : Restores a page to the selected version. To view a specific version of a page, just click a version label in the Page History page. The selected version of that page will be displayed. Compare the current version with the selected one . Replace the current version with the selected version . Go to the Page History page . View content of the previous version by selecting Prev. View content of the next version by selecting Next. Wiki keeps track of histories of changes on a page by maintaining a version of the page each time it is modified. To compare two versions, select two checkboxes corresponding to each relevant version, then click Compare the selected versions. A page which shows the changes between these two versions will be displayed. Words/lines which are red-highlighted with strike-throughs indicate that they were removed. Words/lines highlighted in green indicate that they were added. Only two revisions can be selected at one time. When you notice that there are changes in the current page version that you are not satisfied, you can rollback to an older version of that page quickly. To restore to an older version, click corresponding to your desired version in the Page History page. Restoring to an older version will create a copy of that version. For example, if the [current version (v.2)] is restored to the [older version (v.1)], Wiki will create a new version (v.3) containing content of v.1. The version v.3 will become the current version. Watching a page allows you to receive a notification message about any changes in the page. Click More in the Page Control area, then select Watch from the drop-down menu. A pop-up that informs you have started watching the page will appear. Click OK to close it. Open the page which you are watching. Click More in the Page Control area, then select Stop Watching from the drop-down menu. A pop-up that informs you have stopped watching the page will appear. Click OK to close it. Select a page that you want to move. 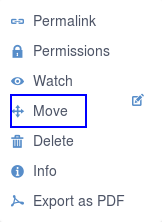 Click More in the Page Control area, then select Move Page from the drop-down menu. The form to select the destination page appears. Open the page you want to delete, then select More in the Page Control area. Click Delete Page from the drop-down menu. Click OK in the confirmation message to accept your deletion. The Delete Page action is not displayed when you are in the Wiki Home. Instructions on how to create/edit/delete a Wiki page template. Also, you will know how to quickly search for your desired template. Instructions on how to manage the permissions of specific users, groups and memberships on a Wiki or a page. Instructions on how to use WebDAV to access your workspace and edit a Wiki page. When adding a new page, you are not required to write the content from scratch. You can start by selecting a page template which is actually a Wiki page with predefined content. 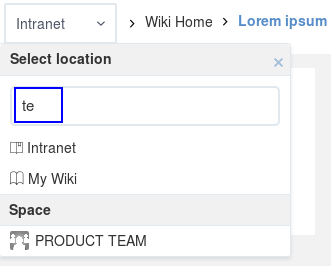 In the Browse menu, click Wiki Settings to display the templates management form. 1. Input a word included in the title of your desired template in the Search textbox. Press the Enter key to start your search. All matching results which contain your entered search term are displayed right below the textbox. The Search function is only performed by the template titles and you must enter a complete word into the Search textbox. For example, to find the template whose title contains “daily report”, you can input “report” rather than “repo”, or “daily” rather “ly”. 1. Click Add More Templates in the Wiki Settings page and the sample template form appears. Add the title for the template. Write the description in the Description…. Write the content for the template. 5. Click Save Template to accept creating the new template. A message will inform your successful template creation. Click corresponding to the template you want to edit. Change the title, the description or the content as you want. Click Save Template to accept your changes. Click corresponding to the template you want to delete. The Page Permissions allows you to set the View and Edit permissions for a specific Wiki page. Open a Wiki page that you want to set the permissions. Click More and select Page Permissions from the drop-down menu. The Page Permissions form appears. Pages are viewable/editable according to the Wiki permission. 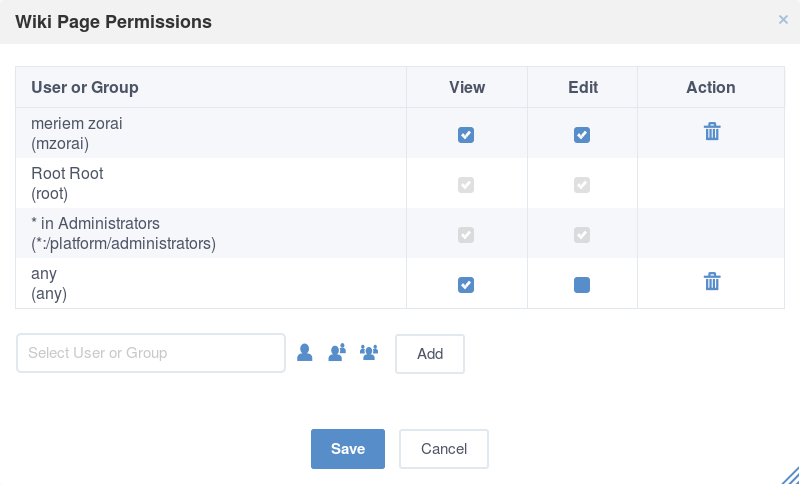 On each page, a user with the Admin Pages permission will be able to override the view and edit permissions on a specific page. A Page Permissions action appears in the page action menu when the user has the Admin Pages permission. 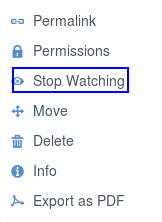 You can add and delete the View Pages Permission or the Edit Pages Permission for the page. Do the same as Adding Wik permissions and Deleting Wiki permissions. that group, regardless of their membership role. affect both its children and parents. Wiki permissions determine which actions a user can perform. A permission can be assigned to any users, groups or memberships. To change the Wiki permissions, click Browse and select Wiki Settings from the drop-down list. 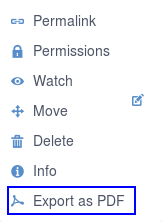 Select the Permission tab in the Wiki Settings page. View Pages Specifies who can view and watch pages of this Wiki, its attachments and history. Edit Pages Specifies who can edit pages of this Wiki. Admin Pages Specifies who have the administration rights on pages of this Wiki. Admin Wiki Specifies who can administrate the Wiki permissions and settings. Adding Wiki permissions of the users, groups and memberships. 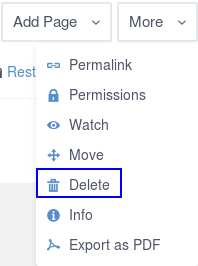 Deleting Wiki permissions of the users, groups and memberships. You can add permissions for individual users, groups of users or memberships. 1. Click to assign permissions to a user, a membership or a group respectively. 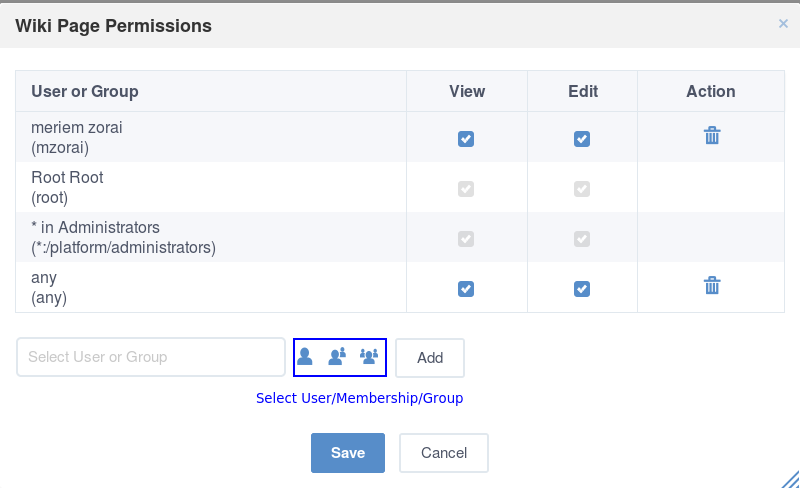 The form to select the user, the membership and the group appears. Select a user, a membership or a group, then click Add. When ticking any permissions above, if you select a group with the * membership, this permission will be granted to all users of that group, regardless of their membership role. 3. Click Add to add the selectors to the User or Group column in the Permission form. 4. Tick the checkboxes corresponding to each permission you want to assign to the selectors. 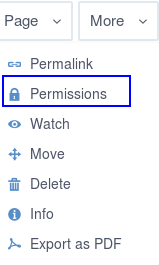 View and Edit permissions are applied by default to any Wiki pages unless specific page permissions are set. The super user has all permissions implicitly. To delete the permissions of a user, group or membership, just click corresponding to a user or group or membership in the Permissions form. After successful login, you will see the WebDAV drive with all content in that Wiki space. Each folder is a wiki page. The folder name is the same as the wiki page title. “content” is the file that stores the page content. Now you can access this drive anytime and manage its folders/files via WebDAV. See Editing a wiki page using WebDAV for more details. Go to the folder that contains the content you want to edit. 2. Use your text editor to edit the “Content” file in this folder. You can use the wiki syntax to format content as normal. You can copy/move/delete a page by copying/moving/deleting the corresponding folder.